L: 38.5" x W: 36" x H: 39"
Rexford Microfiber Recliner Create a cozy, casual feel in your living room, den or basement with the Rexford recliner. It features chaise-style reclining with 2 positions, so you can sit back and relax. Plus, the microfiber upholstery is stain-resistant, making it great for your family. Create a cozy, casual feel in your living room, den or basement with the Rexford recliner. It features chaise-style reclining with 2 positions, so you can sit back and relax. Plus, the microfiber upholstery is stain-resistant, making it great for your family. Inside Arm to Arm: 18.5"
I ordered this online and picked it up in just 3 days. I was amazed at how quick and easy it was to assemble this recliner, no tools needed. I unpacked it and assembled it in less than 10 minutes. It is very comfortable and opens and closes easily. My father who refuses to sleep in a bed at age 78 finds comfort and is able to sleep comfortably in this. He’s happy and said he sleeps well. So if he’s happy I’m definitely happy. My father kept losing his balance when getting out of his old recliner so I ordered this one for him. He loves it and it is extremely comfortable. No more losing his balance as it does not rock and is stable. Very soft and very comfortable. I highly recommend this recliner. very comfortable, nice piece and good price. I love it!!! I'm enjoying the recliner because of the comfort that it provides me. Love the look & feel of these chairs!! Went to buy ONE & ended up buying TWO!! The recline combined with leg rest is perfect for my mom!! She occasionally needs to elevate her legs. My parents were & are delighted with their new chairs!! I bought them each a chair for Father's Day. Goes perfect in their living room!! Very comfortable and economical. We got 2 and got couch to match. In store color looked different. Tag said dark brown which it was. Still very nice. The delivery went smoothly and men were very polite and careful. I recommend them highly. So comfortable - I can see myself falling asleep in this often! I purchased 2 Rexford recliners and they are gorgeous, so comfortable and great support. Got them for a great price along with Platinum care at a very reasonable price. They were delivered on time and with a minimum of fuss. Wonderful! Love it.. so comfy that I can sleep on it! The color is very nice too . So worth it!!! We value you as a customer and are sorry that you have had an unfavorable experience with your order. It is our intention that each of our customers have the best experience possible. We sell products from many vendors both in our full-line showrooms and outlets and expect that the same experience and quality be delivered regardless. If your experience or the quality of your product did not meet your expectations we would love an opportunity to make that right. Please forward your order details, contact information and a copy of your concerns to rfcare@raymourflanigan.com. I absolutely love the chair! It is exactly what I wanted . I have neuropathy. I wanted a chair I can sink into & be surrounded by comfort . The delivery men were polite & helpful . I have purchased furniture from Ray Mor & Flanigan in the past. Very well pleased. Will do so in the future if the need arises . I love my new chair.It is everything I was looking to purchase. The chair reclines easily and will go totally back, great for napping! Also a wonderful feature for me, at 4'11', is getting it into an upright position without a lot of effort. I love the feel of the fabric and the size is perfect for me! And best of all, I love that there is no gap between the chair and the footrest !! It was a pleasure shopping at Raymore & Flanigan's. The store is bright, spacious and beautifully decorated. My sales consultant, Jeremey, was courteous, listening to what I was looking for in a recliner. Although he showed me other recliners, he took me to the exact chair I had described. He was well informed about the merchandise. He inquired if I would like to look at something else but he never made me feel pressured. I will certainly be a return customer. Very comfortable worth the money I would recommend this product . I was happy with the delivery. Looks great in my den. Very comfortable and I would recommend this product. I love this recliner! It is very comfortable and a great size! Terrific recliner for the price! Was looking for an inexpensive recliner for home office in the basement. Because it's 2 pieces, it was easy to move down narrow stairway. Put together in minutes. Looks great and is very comfortable. It won't get a great deal of use so I'm sure it will last forever. It was a perfect fit for my father who is recovering from Chemo therapy, the chair was set up in the living room and he is very comfortable in it. Great purchase and was ready in time for when he came home, now he won't get out of the couch!! LOL! I was in the market for two recliners, and saw this one on Raymour & Flanigan's website. I stopped by to check it out, and was impressed by how comfortable it was. I bought two, had them delivered, and I am extremely happy with them. I would definitely recommend this recliner. It is very, very comfortable. Lily loves it and Mom too! 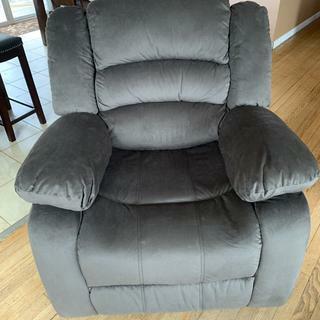 I got a great price in store for this amazingly soft/comfy recliner. Best use of a tax return ever! We love our new recliner from Raymore and Flanagan! Our new recliner is so comfortable I don’t want to get off of it. Love our new recliner, . We have bought all our furniture from you for the last twenty years! I love it! Nice and firm. It is the perfect size for my husband and I. Our other one was a bit too big for our living room so this one fits perfect. Deliciously comfy! Easy set up and delivery. Title’s fine, and so is the chair. Good chair,good price. I had wished it would be the same color brown as one we brought previously but it isn’t but I’m getting used to it. I’m told the chair is very comfortable so I’m happy with it. its very comfortable nothing else to say. I saw it on line .the price was ok looks like the one I had . met kevin oneil sales ordered it came three days later I love it . We we're looking for an affordable recliner for our home and this one is amazing. It's sturdy and comfortable and surprisingly affordable. It's the perfect fit for our home. The recliner is very comfortable to sit in. It works perfectly and is easy to open and close. Soft and comfortable. When closing it after reclining you need a little strength, but overall a good recliner. Very comfortable. Love the fabric. We were told that these were rocking recliners and they are not. Desk chair was broken waiting to hear what they are gonna do to remedy this issue ? Hello Bill, we're very sorry to hear about this experience and would like to look into this for you. Could you e-mail your order details, contact information and a copy of your concerns to rfcare@raymourflanigan.com so we can better assist? Thank you! The cushioning is very under par. Should be more durable. In less than a week the part where it supports your legs broke on one side. Can't close it anymore. Really disappointed with this recliner. Tried calling the business and they gave us attitude. Very rude and not helpful. Was not able to return or get any credit. Never giving this business again. Should have listened to what other people were saying around town. Don't shop at this place. Save your money and go somewhere else. Very poor quality furniture. does the recliner recline in a sitting position? in the pictures it seems so far back as if I would be practically laying down. thanks. BEST ANSWER: The Rexford Microfiber Recliner includes two reclining positions which include a sitting and fully reclining postion. What side is the lever/button on? BEST ANSWER: It’s on the right side, high up. Is this a rocker recliner? BEST ANSWER: No. It is a chair that reclines in 2 different positions. However it doesn't lock into a position, so it easily shifts. This is not a rocker recliner. I love this recliner. Very comfortable. No, it is not a rocker. I am 6 feet tall. Wit fit me well? BEST ANSWER: My husband is 5’10” and when he puts the foot of the chair up, his feet hang over it. So, I believe it won’t fit you well. I'm almost 6" and the chair feels large to me. I know there’s a button for the reclining but can you push it manually also with your legs ? 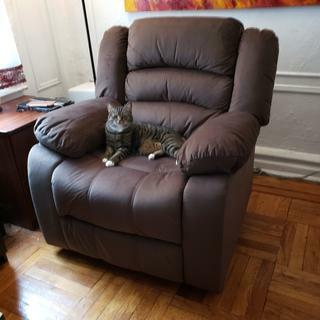 BEST ANSWER: Hello Cat, thank you for your interest in the Rexford Microfiber Recliner! This item meets all California furniture standards. Can I get this chair in gypsy chocolate? BEST ANSWER: The Rexford Recliner does not offer special order fabric options. BEST ANSWER: The Rexford Microfiber Recliner does not rock.